I made fried rice for today's bento. Egg, cabbage, pok choy, breakfast sausage, and smoked ham were thinly sliced and put inside the fried rice. Decorated the fried rice with flower picks and girl with uniform from yellow and white egg sheets, crab stick, nori, and chicken ham. Green peas were used for the border. Almost forgot, I've done some short article for The Urban Mama website in Indonesia. This is a great website and every moms can join to discuss everything at the forum including bento. Hope can spread the bento love from this short article. Thanks a lot for TUM to put my short article. And big thanks for Jie too for featuring me on his great blog in cool section called 'Initial 5'. (Note : both of the webs are written in Indonesian language). this month BOMB - Back To School Bento. You can check it from Debra's blog, Hapa Bento. Yesterday, I received 'The Just Bento Cookbook' by Makiko Itoh. I ordered it from Bento&Co. and I love the book. The cookbook contains 25 attractive bento menus and more than 150 recipes. Easy to read in English, very practical guides with notes, tips and timeline included for the recipe. The other things that you can find in this book are very interesting sections on bento making equipment, staples to make and stock, speed and safety tips, planning chart and a glossary. Bento doesn't necessary have to be cute but healthy and balanced bento is important. You will get the whole idea if you get your copy of this great book. This book will be a very valuable resource for my learning in bento making. So much information about bento inside that will be too good too pass. This book is worth to be added to my book collections. So hope you can get your copy too and enjoy your bento making. Wow, so much news! Congrats on the article-- how exciting! So cool about the Just Bento cookbook too! Really need a copy for myself as well. I'm sure it is invaluable! Adorable girl in your pretty bento too! Congratulations on the article Lia. I'll check it later on. I adore this little girl's pleated skirt. Her school uniform is perfect! 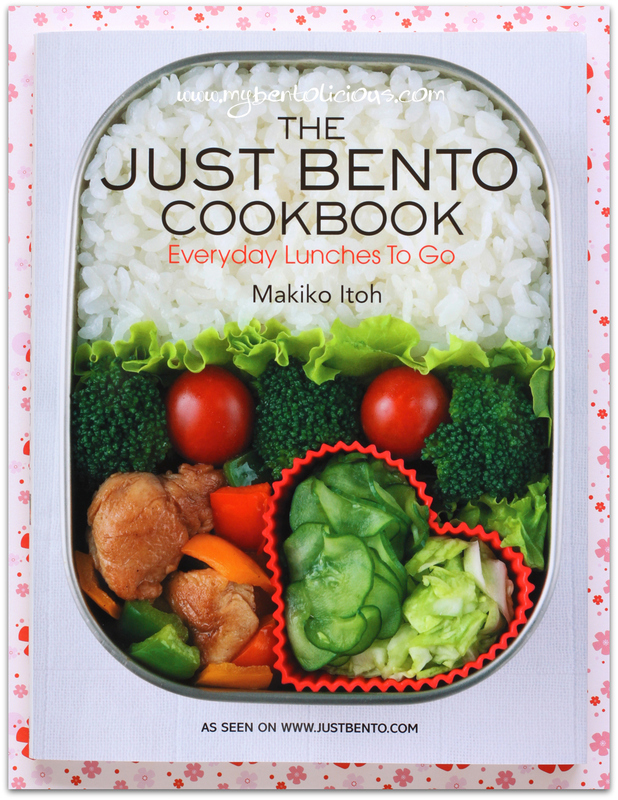 It's good to know that the 'Just Bento' cookbook is finally out, I've been looking forward to buying it...! Thanks for the info :). and hey, congrats for the article :)! @Journal Mommy Yenny : You bet right ;) Thanks a lot Yen! This bento is sooo cute! Just adorable. Congrats on the article, too! Hi Lia, I really admire your skills. Your bentos are always so cute and pretty. I might like to order the book. waaahh,, bagus banget bentonya! telaten sekali mbak Lia ini..
kayaknya aku nggak sanggup deh disuruh buat begituan pagi2. seneng deh liat foto bentonya. Kayaknya aku nggak sanggup deh buat begituan pagi2. Keep up the good work ya..
What a cute back to school bento!!!! Love the little girl... so nicely done! @Koci : Thanks a lot! @Anncoo : Thanks a lot Ann! Dunno whether you can get it from Kinokuniya or Borders there ... If you can't then just buy it online from Amazon.com or Bento&Co. Thank you so much Lia! It's an honor to receive such a positive review from a talented bentoist like you ^_^ And congratulations on the article!! What a cute little schoolgirl! I know my girls would love this bento...I'll have to see if I can make something similar. Such a great bento for Debra's back to school theme! I have a bento in mind, but we'll see if I have time to try it for the contest. Congrats on your article, that is very cool! And I need to order my copy of Just Bento now! I have been looking forward to it for a while now. Have a great day Lia! I'm so happy that the bento culture spreads around the world and many Indonesian people also enjoy it. The girl is well-done like cut-papercraft. SO pretty and cute!! The girl is a fine art piece, so well-done and beautiful. Congrats on your articel--your bentos are so beautiful and inspiring that they automatically spread "bento love"! 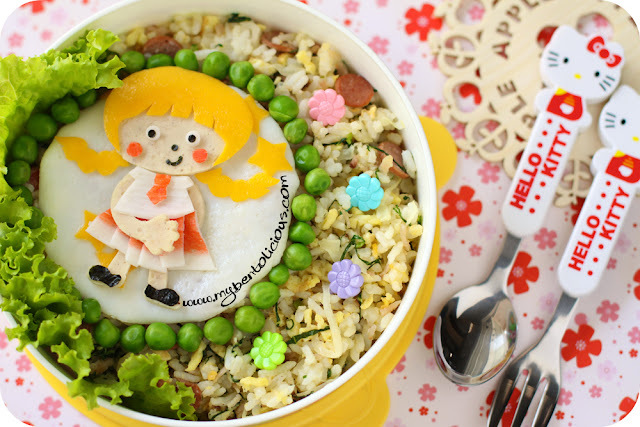 The clever details on this sweet back-to-school bento are such a treat, amazed by the pleated skirt! Love the back to school bento!!! I have to pick up a copy of Maki's book too.